The ejection fraction in a patient with severe mitral regurgitation should be 65% or greater. If less than 65%, then left ventricular systolic dysfunction may be present, possibly due to the mitral regurgitation itself. RIPE: If sensitive to isoniazid and rifampin, can narrow down to I+R after 2 months. Duration of 9-12 months. Sweet’s syndrome (the eponym for acute febrile neutrophilic dermatosis) is characterized by a constellation of clinical symptoms, physical features, and pathologic findings which include fever, neutrophilia, tender erythematous skin lesions (papules, nodules, and plaques), and a diffuse infiltrate consisting predominantly of mature neutrophils that are typically located in the upper dermis. Several hundreds cases of Sweet’s syndrome have been published. Sweet’s syndrome presents in three clinical settings: classical (or idiopathic), malignancy-associated, and drug-induced. Classical Sweet’s syndrome (CSS) usually presents in women between the age of 30 to 50 years, it is often preceded by an upper respiratory tract infection and may be associated with inflammatory bowel disease and pregnancy. Approximately one-third of patients with CSS experience recurrence of the dermatosis. The malignancy-associated Sweet’s syndrome (MASS) can occur as a paraneoplastic syndrome in patients with an established cancer or individuals whose Sweet’s syndrome-related hematologic dyscrasia or solid tumor was previously undiscovered; MASS is most commonly related to acute myelogenous leukemia. The dermatosis can precede, follow, or appear concurrent with the diagnosis of the patient’s cancer. Hence, MASS can be the cutaneous harbinger of either an undiagnosed visceral malignancy in a previously cancer-free individual or an unsuspected cancer recurrence in an oncology patient. Drug-induced Sweet’s syndrome (DISS) most commonly occurs in patients who have been treated with granulocyte-colony stimulating factor, however, other medications may also be associated with DISS. The pathogenesis of Sweet’s syndrome may be multifactorial and still remains to be definitively established. Clinical and laboratory evidence suggests that cytokines have an etiologic role. Systemic corticosteroids are the therapeutic gold standard for Sweet’s syndrome. After initiation of treatment with systemic corticosteroids, there is a prompt response consisting of dramatic improvement of both the dermatosis-related symptoms and skin lesions. Topical application of high potency corticosteroids or intralesional corticosteroids may be efficacious for treating localized lesions. Other first-line oral systemic agents are potassium iodide and colchicine. Second-line oral systemic agents include indomethacin, clofazimine, cyclosporine, and dapsone. The symptoms and lesions of Sweet’s syndrome may resolve spontaneously, without any therapeutic intervention; however, recurrence may follow either spontaneous remission or therapy-induced clinical resolution. Look forward to a more extensive review of Sweet’s Syndrome. There will be a new case challenge next week – get ready for it! Dr. Rutherford gave us an excellent lecture about hemostasis disorders and therapy. Take a look at her lecture below (note, if you are an email follower, this post is visible only on the actual website – click the title above). Being angry on Twitter causes heart disease: Big Data fact or fiction? A spate of articles have reported a study that claims the ability to predict a communities’ risk of heart disease from the language most commonly used by that community on twitter. Analysing 148 million tweets, the researchers from the University of Pennsylvania and the University of Melbourne mapped the tweeters to counties in the US for which they also had data about the incidence of heart disease and other health and demographic data. The researchers found that they got a higher correlation between the language used in tweets from people in those counties and heart disease than the correlation between heart disease and other indicators such as income and education, smoking, chronic disease and racial background. The language that signalled the increased likelihood of heart disease was broken down into 3 different categories of hostility/aggression, hate/interpersonal tension and boredom/fatigue. Words that were frequently used within those categories included words such as “f***”, “hate”, “drama”, “b****” in the hostility/hate categories through to “tired” and “shower” in the boredom category. People tweeting in areas that had a lower risk of heart disease on the other hand tended to use words such as “conference”, “student”, “holiday” and “faith”. The mainstream press, encouraged by the researchers involved in the study, have picked up on this study as another example of how “big data” and social media can reveal a whole range of information about a population’s health and well-being. 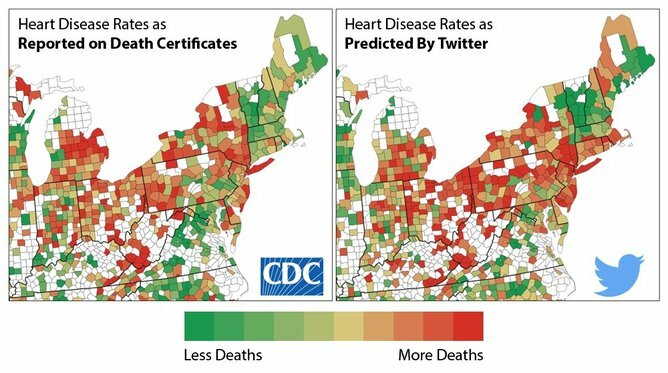 One report featured the graphic from the study that showed the actual incidence of heart disease in a part of the US with that predicted by Twitter. The interesting thing about the graphic is that if you actually compare the specific areas in each of the two diagrams, they are not particularly the same at all. The graphic is a great example of how data visualisation can be used to mislead the viewer. The two diagrams seem similar because they use the same colours and have identical areas which have to be the same because no data is available. Pick any two identical blocks however and the chances are that they won’t be the same colour. This is because the predictive power of the twitter analysis is actually quite low. Granted, the analysis may be slightly better than using a combination of other indicators such as income, education, chronic disease and race, but that difference is in actual fact minuscule. So what is the general language on Twitter actually saying? Well, it is likely that the language used in tweets may reflect the socio-economic level of a particular area. But even this claim is making a number of unsubstantiated assumptions. It is easy to suppose that lower socioeconomic populations would tweet more frequently about things they hate using swear words than people who are more likely to be educated from higher socioeconomic backgrounds. Interestingly however, the study claims to have “controlled” for socio-economic status, which means that the researchers believed that the language used was not simply a representation of this status. Unfortunately, no details are given of how they did this and so it is not possible to say whether this was actually a reasonable assumption. The study is interesting in that it suggests that a specific communities’ makeup can be identified by the language that they use on social media. This in turn may be an indicator of other factors such as the specific community’s health and well-being and the consequences of that health and well-being. However, as attractive as those suggestions may be, the study showed weak correlations and gave very little underlying support for any particular theory of “causation”. So as much as they could speculate, the researchers could really not say why they saw these statistical results. The paper actually highlights some of the fundamental problems with so-called big data where large numbers distort statistics to point at imagined relationships. What this study definitely does not say is that being angry on twitter will lead to, or is anyway related to, heart disease, which has been the unfortunate suggestion in the selling of the study in news reports. This article was originally published by David Glance on The Conversation. Read the original article. Infographic brought to you by Carrington College, California. Normal pressure hydrocephalus (NPH) is a syndrome characterized by gait impairment, cognitive decline, and urinary incontinence, and is associated with ventriculomegaly in the absence of elevated cerebrospinal fluid (CSF) pressure. Gait disturbances: typically the first signs of INPH, and have been variously described as apraxic, bradykinetic, glue-footed, magnetic, parkinsonian and shuffling; often present with a history of falls; no significant motor weakness. Cognitive deficits: typically of the subcortical type, characterized by inattention, psychomotor retardation and difficulty with executive function. Neurodegenerative diseases, vascular etiologies and urological disorders: peripheral neuropathy, cervical or lumbar stenosis, arthritis, vestibular diseases and Parkinson’s disease. Dementia: Alzheimer’s dementia, diffuse Lewy body disease and vascular dementia – the absence of apraxia, agnosia and aphasia can help differentiate INPH from cortical dementias. Diagnosis: based on history, physical exam, neuroimaging, and exclusion of other causes. A frontal horn ratio (Evans’ index), defined as the maximal frontal horn ventricular width divided by the transverse inner diameter of the skull, signifies ventriculomegaly if it is 0.3 or greater. No visible evidence of obstruction to CSF flow. Accomplished through surgical diversion of CSF. This is accomplished by implanting a shunt to drain CSF from either the intracranial ventricular system or the lumbar subarachnoid space to a distal site, such as the peritoneal or pleural cavity or the venous system, where the CSF can be reabsorbed. The most common shunts utilized today are ventriculoperitoneal (VP) and ventriculoatrial (VA) shunts.